Schrecker, The Age of McCarthyism: A Brief History With Documents, 2nd ed. Weeks, ed., "They Made Us Many Promises:" The American Indian Experience 1524 to the Present, 2nd ed. Power Point, Technology and the Web: More Than Just an Overhead Projector for the New Century? "General Christopher C. Andrews: Leading the Minnesota Forestry Revolution," by Anna M. Rice, 091-115. Rapoport, Sarah, "Rosalind Franklin: Unsung Hero of the DNA Revolution," 116-27. Rice, Anna M., "General Christopher C. Andrews: Leading the Minnesota Forestry Revolution," 091-115. "Rosalind Franklin: Unsung Hero of the DNA Revolution," by Sarah Rapoport, 116-27. Hering, Katharina, interviews, "Interviews with Exemplary Teachers: Bill Bigelow and Michele Forman," 397-406. "Interviews with Exemplary Teachers: Bill Bigelow and Michele Forman," by Roy Rosenzweig, intro., and Katharina Hering, interviews, 397-406. Rosenzweig, Roy, intro., "Interviews with Exemplary Teachers: Bill Bigelow and Michele Forman," 397-406. "Coastal East Africa and the Western Indian Ocean: Long-Distance Trade, Empire, Migration, and Regional Unity, 1750-1970," by Erik Gilbert, 7-34. Gilbert, Erik, "Coastal East Africa and the Western Indian Ocean: Long-Distance Trade, Empire, Migration, and Regional Unity, 1750-1970," 7-34. Howlett, Charles F., "Studying America's Struggle Against War: An Historical Perspective," 297-330. Stearns, Peter N. "Treating Globalization in History Surveys," 153-60. "Studying America's Struggle Against War: An Historical Perspective," by Charles F. Howlett, 297-330. "Treating Globalization in History Surveys," by Peter N. Stearns, 153-60. "A Systematic Approach to Improve Students' Historical Thinking," by Frederick D. Drake and Sarah Drake Brown, 465-89. Brown, Sarah Drake, co-auth., "A Systematic Approach to Improve Students' Historical Thinking," 465-89. "Constructivism in the Community College Classroom," by Michael Henry, 065-74. DenBeste, Michelle, "Power Point, Technology and the Web: More Than Just an Overhead Projector for the New Century?," 491-504. Drake, Frederick D., co-auth., "A Systematic Approach to Improve Students' Historical Thinking," 465-89. Dzuris, Linda, "Using Folk Songs and Ballads in an Interdisciplinary Approach to American History," 331-42. Henry, Michael, "Constructivism in the Community College Classroom," 065-74. "How I Arrived on the Web: A History Teacher's Tale," by Howard M. Wach, 075-88. Longhurst, James, "World History on the World Wide Web: A Student Satisfaction Survey and a Blinding Flash of the Obvious," 343-56. "Power Point, Technology and the Web: More Than Just an Overhead Projector for the New Century?," by Michelle DenBeste, 491-504. "Using Folk Songs and Ballads in an Interdisciplinary Approach to American History," by Linda Dzuris, 331-42. Wach, Howard M., "How I Arrived on the Web: A History Teacher's Tale," 075-88. "World History on the World Wide Web: A Student Satisfaction Survey and a Blinding Flash of the Obvious," by James Longhurst, 343-56. Bolton, Marie, "Poor Relation or Honorable Peer? Reflections on American History in French Universities," 443-64. Guarneri, Carl J., "Internationalizing the United States Survey Course: American History for a Global Age," 037-64. "Implementing the La Pietra Report: Internationalizing Three Topics in the United States History Survey Course," by Thomas J. Osborne, 163-75. "Internationalizing the United States Survey Course: American History for a Global Age," by Carl J. Guarneri, 037-64. 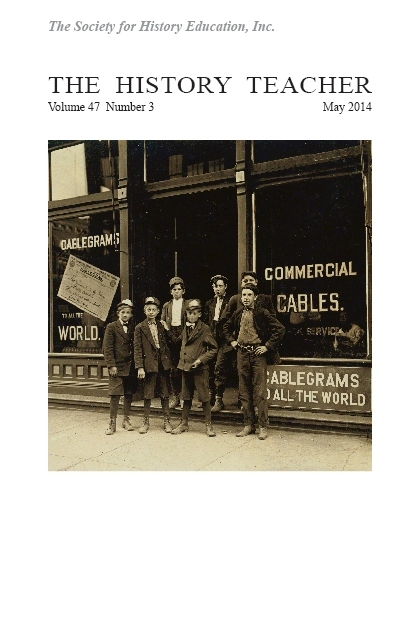 "Internationalizing United States History-Editor's Note," by Nancy Quam-Wickham, 035-36, 161-62, 441-42. Osborne, Thomas J., "Implementing the La Pietra Report: Internationalizing Three Topics in the United States History Survey Course," 163-75. "Poor Relation or Honorable Peer? Reflections on American History in French Universities," by Marie Bolton, 443-64. Quam-Wickham, Nancy, "Internationalizing United States History-Editor's Note," 035-36, 161-62, 441-42. Cobb, Casey, co-auth., "History in Perspective (HIP):A Collaborative Project Between the University of New Hampshire, SAU #56, and 13 Other School Districts," 186-205. "DeTocqueville's Ghost: Examining the Struggle for Democracy in America," by Stan Pesick and Shelley Weintraub, 231-51. Forcey, Charles, co-auth., "History in Perspective (HIP):A Collaborative Project Between the University of New Hampshire, SAU #56, and 13 Other School Districts," 186-205. 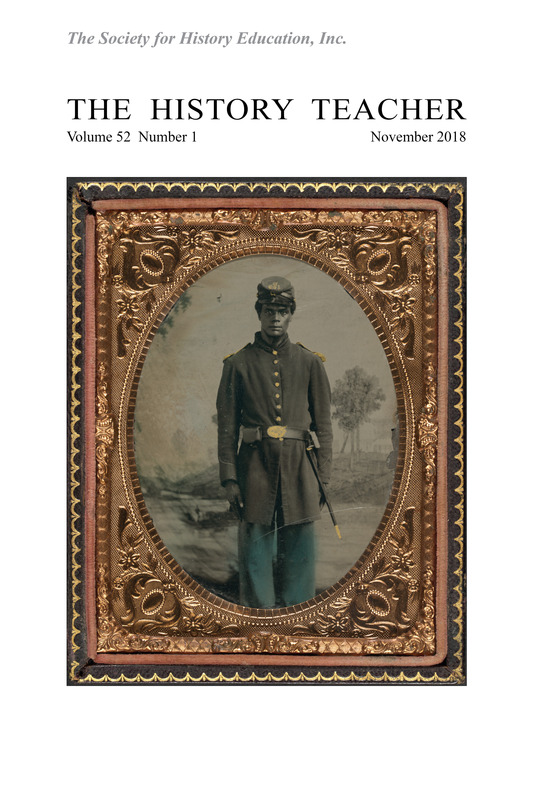 "History in Perspective (HIP):A Collaborative Project Between the University of New Hampshire, SAU #56, and 13 Other School Districts," by Judith Moyer, Joseph Onosko, Charles Forcey and Casey Cobb, 186-205. Hudson, Jr., Larry E., co-auth., "Oral History: An Inclusive Highway to the Past," 206-20. Moyer, Judith, co-auth., "History in Perspective (HIP):A Collaborative Project Between the University of New Hampshire, SAU #56, and 13 Other School Districts," 186-205. Onosko, Joseph, co-auth., "History in Perspective (HIP):A Collaborative Project Between the University of New Hampshire, SAU #56, and 13 Other School Districts," 186-205. "Oral History: An Inclusive Highway to the Past," by Larry E. Hudson, Jr. and Ellen Durrigan Santora, 206-20. Pesick, Stan, co-auth., "DeTocqueville's Ghost: Examining the Struggle for Democracy in America," 231-51. Quam-Wickham, Nancy, "The Teaching American History Program-Editor's Note," 177. Santora, Ellen Durrigan, co-auth., "Oral History: An Inclusive Highway to the Past," 206-20. Stein, Alex, "The Teaching American History Program: An Introduction and Overview," 178-85. 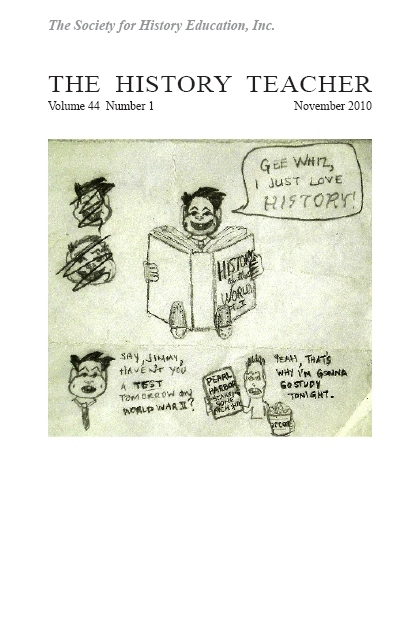 "Teaching American History Program, The: An Introduction and Overview," by Alex Stein, 178-85. "Teaching American History Program, The-Editor's Note," by Nancy Quam-Wickham, 177. "Wisconsin Collaborative United States History Professional Development Program, The," by Dorothy Zeisler-Vralsted, 221-30. Weintraub, Shelley, co-auth., "DeTocqueville's Ghost: Examining the Struggle for Democracy in America," 231-51. Zeisler-Vralsted, Dorothy, "Wisconsin Collaborative United States History Professional Development Program, The," 221-30. Brown, David, "Redefining American History: Ethnicity, Progressive Historiography and the Making of Richard Hofstadter," 527-48. "Historian As a Social Critic, The: Christopher Lasch and the Uses of History," by Kevin Mattson, 375-96. Mattson, Kevin, "The Historian As a Social Critic: Christopher Lasch and the Uses of History," 375-96. "Redefining American History: Ethnicity, Progressive Historiography and the Making of Richard Hofstadter," by David Brown, 527-48. "AP-Gate," by Glenn Whitman, 357-65. Dichtl, John, "Teaching Integrity," 367-73. Don, Patricia Lopes, "Establishing World History as a Teaching Field: Comments from the Field," 505-25. "Establishing World History as a Teaching Field: Comments from the Field," by Patricia Lopes Don, 505-25. "Teaching Integrity," by John Dichtl, 367-73. Hood, David, "Keeping Up with the Classics," 253-58. "Keeping Up with the Classics," by David Hood, 253-58. 19th Century Germany: Politics, Culture and Society 1780-1918, by John Breuilly, ed., revd., 261-62. A Short History of the Civil War at Sea, by Spencer C. Tucker, revd., 283-84. Adams, Michael C.C., Echoes of War: A Thousand Years of Military History in Popular Culture, revd., 407-08. Adelman, Jeremy, co-auth., Worlds Together, Worlds Apart: A History of the Modern World from the Mongol Empire to the Present, revd., 562-63. Adomanis, James F., rev., Past Present & Personal: Teaching Writing in U. S. History, by William C. Kashatus, 554-55. African Military History and Politics: Coups and Ideological Incursions, 1900-Present, by A.B. Assensoh and Yvette M. Alex-Assensoh, revd., 549-50. Age of McCarthyism, The: A Brief History With Documents, 2nd ed., by Ellen Schrecker, revd., 276-77. Alex-Assensoh, Yvette M., co-auth., African Military History and Politics: Coups and Ideological Incursions, 1900-Present, revd., 549-50. "All the World is Here!" The Black Presence at White City, by Christopher Robert Reed, revd., 421-22. Allison, William Thomas, rev., Debating the Origins of the Cold War: American and Russian Perspectives, by Ralph B. Levering, Vladimir O. Pechatnaov, Verena Botzenhart-Viehe, and C. Earl Edmondson, 417-18. American Indians in American History 1870-2001, by Sterling Evans, revd., 414. American Religious Debate Over Birth Control, 1907-1937, The, by Kathleen A. Tobin, revd., 563-64. An Honorable Defeat: The Last Days of the Confederate Government, by William C. Davis, revd., 411-12. Anderson, Annelise, co-ed., Reagan in His Own Hand: The Writings of Ronald Reagan that Reveal His Revolutionary Vision for America, revd., 278-79. Anderson, Martin, co-ed., Reagan in His Own Hand: The Writings of Ronald Reagan that Reveal His Revolutionary Vision for America, revd., 278-79. Arnstein, Walter L., rev., Neville Chamberlain, by David Dutton, 134-35. Aron, Stephen, co-auth., Worlds Together, Worlds Apart: A History of the Modern World from the Mongol Empire to the Present, revd., 562-63. Assensoh, A.B., co-auth., African Military History and Politics: Coups and Ideological Incursions, 1900-Present, revd., 549-50. Bellas, Joseph, rev., The Scopes Trial: A Brief History with Documents, by Jeffrey P. Moran, 271-72. Benowitz, June Melby, Days of Discontent: American Women and Right-Wing Politics, 1933-1945, revd., 259-60. Berrett, Jesse, rev., Reagan in His Own Hand: The Writings of Ronald Reagan that Reveal His Revolutionary Vision for America, by Kiron K. Skinner, Annelise Anderson, and Martin Anderson, eds., introduction and commentary; foreword by George P. Schultz, revd., 278-79. Beyond the Field Trip: Teaching and Learning in Public Places, by Uma Krishnaswami, revd., 268-69. Bielakowski, Alexander M., rev., African Military History and Politics: Coups and Ideological Incursions, 1900-Present, by A.B. 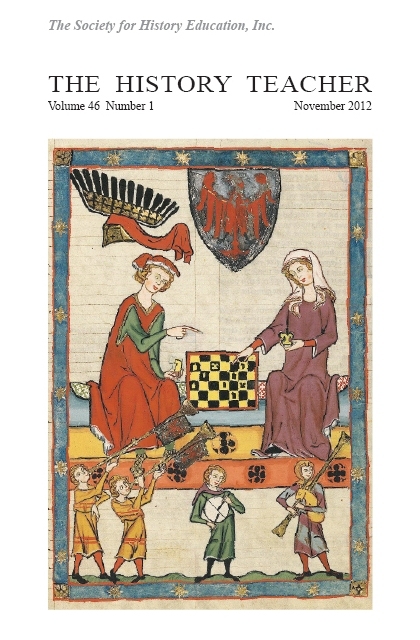 Assensoh and Yvette M. Alex-Assensoh, 549-50. Binder, Frederick M., rev., Hungering for America: Italian, Irish, and Jewish Foodways in the Age of Migration, by Hasia R. Diner, 412-13. Birth of the Grand Old Party, The: The Republicans' First Generation, by Robert F. Engs and Randall M. Miller, eds., revd., 550-51. Bischoff, Henry, Immigration Issues, revd., 408-09. Borowski, Lisa, rev., The Navy Times Book of Submarines: A Political, Social, and Military History, by Brayton Harris; Walter J. Boyne, ed., 265-66. Botzenhart-Viehe, Verena, co-auth., Debating the Origins of the Cold War: American and Russian Perspectives, revd., 417-18. Bourne, Russell, Gods of War, Gods of Peace: How the Meeting of Native and Colonial Religions Shaped Early America, revd., 260-61. Bower, Kevin P., rev., The Scopes Trial: A Brief History with Documents, by Jeffrey P. Moran, 557-58. Boyne, Walter J., ed., The Navy Times Book of Submarines: A Political, Social, and Military History, revd., 265-66. Breuilly, John, ed., 19th Century Germany: Politics, Culture and Society 1780-1918, revd., 261-62. Bringing the Civil War to the Classroom: A Guide for Teachers, by James I. Robertson, Jr. and William C. Davis, revd., 560. Broadwater, Jeff, rev., Presidential Power from the New Deal to the New Right, by Herbert S. Parmet, 138-39. Browne, Blaine T., rev., Chasing Spies: How the FBI Failed in Counterintelligence But Promoted the Politics of McCarthyism in the Cold War Years, by Athan Theoharis, 280-81. Bryan, John, rev., Samuel Adams, Son of Liberty, Father of Revolution, by Benjamin H. Irvin, 552-53. Buddhists, Hindus, and Sikhs in America, by Gurinder Singh Mann, Paul David Numrich, and Raymond Williams, revd., 137. Building the Kingdom: A History of Mormons in America, Claudia Lauper Bushman and Richard Lyman Bushman, revd., 133-34. Bushman, Claudia Lauper, co-auth., Building the Kingdom: A History of Mormons in America, revd., 133-34. Bushman, Richard Lyman, co-auth., Building the Kingdom: A History of Mormons in America, revd., 133-34. Carroll, James T., rev., Buddhists, Hindus, and Sikhs in America, by Gurinder Singh Mann, Paul David Numrich, and Raymond Williams, 137. Carroll, James T., rev., Gods of War, Gods of Peace: How the Meeting of Native and Colonial Religions Shaped Early America, by Russell Bourne, 260-61. Chasing Spies: How the FBI Failed in Counterintelligence But Promoted the Politics of McCarthyism in the Cold War Years, by Athan Theoharis, revd., 280-81. Contamine, Phillippe, ed., War and Competition between States, revd., 410-11. Dabel, Jane E., rev., Mary McLeod Bethune: Building a Better World Essays and Selected Documents, by Audrey Thomas McCluskey and Elaine M. Smith, eds., 130-31. Davis, William C., An Honorable Defeat: The Last Days of the Confederate Government, revd., 411-12. Davis, William C., co-auth., Bringing the Civil War to the Classroom: A Guide for Teachers, revd., 560. Days of Discontent: American Women and Right-Wing Politics, 1933-1945, by June Melby Benowitz, revd., 259-60. Debating the Origins of the Cold War: American and Russian Perspectives, by Ralph B. Levering, Vladimir O. Pechatnaov, Verena Botzenhart-Viehe, and C. Earl Edmondson, revd., 417-18. Diaz-Brown, William, rev., In the Eagle's Shadow: The United States and Latin America, by Kyle Longley, 555-56. Diner, Hasia R., Hungering for America: Italian, Irish, and Jewish Foodways in the Age of Migration, revd., 412-13. Dunn, Joe P., rev., Harry Truman and Civil Rights: Moral Courage and Political Risks, by Michael R. Gardner, 262-63. Dutton, David, Neville Chamberlain, revd., 134-35. Ebbing of European Ascendancy, The: An International History of the World 1914-1945, by Sally Marks, revd., 418-19. Echoes of War: A Thousand Years of Military History in Popular Culture, by Michael C.C. Adams, revd., 407-08. Edgerton, Keith, rev., The Human Tradition in the American West, by Benson Tong and Regan A. Lutz, eds., 281-82. Edmonds, Anthony O., rev., Transitions in American Education: A Social History of Teaching, by Donald H. Parkerson and Jo Ann Parkerson, 275-76. Edmondson, C. Earl, co-auth., Debating the Origins of the Cold War: American and Russian Perspectives, revd., 417-18. Encyclopedia of Organized Crime in the United States: From Capone's Chicago to the New Urban Underworld, by Robert J. Kelly, revd., 129-30. Encyclopedia of the Clinton Presidency, by Peter B. Levy, revd., 270-71. Engs, Robert F., co-ed., The Birth of the Grand Old Party: The Republicans' First Generation, revd., 550-51. Environmental Debate, The: A Documentary History, by Peninah Neimark and Peter Rhoades Mott, eds., revd., 131-32. Evans, Sterling, American Indians in American History 1870-2001, revd., 414. Facing History and Ourselves, Race and Membership in American History: The Eugenics Movement, a Resource Book, revd., 415. Ferris-Fearnside, Karen, rev., Professional Communities and the Work of High School Teaching, by Milbrey W. McLaughlin and Joan E. Talbert, 419-20. Ferry, Michelle Llyn, rev., Echoes of War: A Thousand Years of Military History in Popular Culture, by Michael C.C. Adams, 407-08. Finch, Edward F., rev., The War of 1812, by David S. Heidler and Jeanne T. Heidler, 416. Firkus, Angela, rev., "They Made Us Many Promises:" The American Indian Experience 1524 to the Present, 2nd ed., by Philip Weeks, ed., 426-27. Fissel, Mark Charles, rev., War and Competition between States, by Phillippe Contamine, ed., 410-11. Follett, Jason, rev., Encyclopedia of the Clinton Presidency, by Peter B. Levy, 270-71. Frost, Jennifer, rev., Immigration Issues, by Henry Bischoff, 408-09. Gardner, Michael R., Harry Truman and Civil Rights: Moral Courage and Political Risks, revd., 262-63. Gods of War, Gods of Peace: How the Meeting of Native and Colonial Religions Shaped Early America, by Russell Bourne, revd., 260-61. Goldstein, Kalman, rev., The Lincoln Memorial and American Life, by Christopher A. Thomas, 424-26. Griffin, Patrick, The People with No Name: Ireland's Ulster Scots Irish, and the Creation of a British Atlantic World, 1689-1764, revd., 264-65. Hall, Deborah C., rev., Whose History? The Struggle for National Standards in American Classrooms, by Lynda Symcox, 423-24. Harris, Brayton, The Navy Times Book of Submarines: A Political, Social, and Military History, revd., 265-66. Harry Truman and Civil Rights: Moral Courage and Political Risks, by Michael R. Gardner, revd., 262-63. Hatley, Paul B., rev., A Short History of the Civil War at Sea, by Spencer C. Tucker, 283-84. Hatley, Paul B., rev., Rethinking the Korean War: A New Diplomatic and Strategic History, by William Stueck, 560-62. Heidler, David S., co-auth., The War of 1812, revd., 416. Heidler, Jeanne T., co-auth., The War of 1812, revd., 416. Higgins, Karen E., rev., Bringing the Civil War to the Classroom: A Guide for Teachers, by James I. Robertson, Jr. and William C. Davis, 560. History: What and Why? Ancient, Modern, and Postmodern Perspective, by Beverley Southgate, revd., 279-80. Hoffert, Sylvia D., When Hens Crow: The Woman's Rights Movement in Antebellum America, revd., 266-67. Hoffman, Abraham, rev., My Blue Heaven: Life and Politics in the Working-Class Suburbs of Los Angeles, 1920-1965, by Becky Nicolaides, 274-75. Holzer, Harold, ed., State of the Union: New York and the Civil War, revd., 135-37. Homel, Michael W., Unlocking City Hall: Exploring the History of Local Government and Politics, revd., 551-52. Horton, Paul, rev., An Honorable Defeat: The Last Days of the Confederate Government, by William C. Davis, 411-12. Horton, Paul, rev., The Birth of the Grand Old Party: The Republicans' First Generation, by Robert F. Engs and Randall M. Miller, eds., 550-51. Howlett, Charles F., rev., Making Citizen Soldiers: ROTC and the Ideology of American Military Service, by Michael S. Neiberg, 272-74. Howlett, Charles F., rev., The United Nations and International Politics, by Stephen Ryan, 139-40. Human Tradition in the American West, The, by Benson Tong and Regan A. Lutz, eds., revd., 281-82. Hungering for America: Italian, Irish, and Jewish Foodways in the Age of Migration, by Hasia R. Diner, revd., 412-13. Hurley, Kari, rev., The Oxford Atlas of World History, by Patrick K. O'Brien, 559. Immigration Issues, by Henry Bischoff, revd., 408-09. In the Eagle's Shadow: The United States and Latin America, by Kyle Longley, revd., 555-56. Irvin, Benjamin H., Samuel Adams, Son of Liberty, Father of Revolution, revd., 552-53. Iversen, Joan Smyth, rev., Days of Discontent: American Women and Right-Wing Politics, 1933-1945, by June Melby Benowitz, 259-60. Judging Lincoln, by Frank J. Williams, revd., 427-28. Kaminski, Theresa, rev., The American Religious Debate Over Birth Control, 1907-1937, by Kathleen A. Tobin, 563-64. Kantz, Barbara, rev., History: What and Why? Ancient, Modern, and Postmodern Perspective, by Beverley Southgate, 279-80. Kashatus, William C., Past Present & Personal: Teaching Writing in U. S. History, revd., 554-55. Kelly, Robert J., Encyclopedia of Organized Crime in the United States: From Capone's Chicago to the New Urban Underworld, revd., 129-30. Kessel, Elizabeth A., rev., When Hens Crow: The Woman's Rights Movement in Antebellum America, by Sylvia D. Hoffert, 266-67. Kotkin, Stephen, co-auth., Worlds Together, Worlds Apart: A History of the Modern World from the Mongol Empire to the Present, revd., 562-63. Krishnaswami, Uma, Beyond the Field Trip: Teaching and Learning in Public Places, revd., 268-69. Kyvig, David E., co-ed., Unlocking City Hall: Exploring the History of Local Government and Politics, revd., 551-52. Lerner, Mitchell B., The Pueblo Incident: A Spy Ship and the Failure of American Foreign Policy, revd., 269-70. Levering, Ralph B., co-auth., Debating the Origins of the Cold War: American and Russian Perspectives, revd., 417-18. Levy, Peter B., Encyclopedia of the Clinton Presidency, revd., 270-71. Lincoln Memorial and American Life, The, by Christopher A. Thomas, revd., 424-26. Longley, Kyle, In the Eagle's Shadow: The United States and Latin America, revd., 555-56. Lutz, Regan A., co-ed., The Human Tradition in the American West, revd., 281-82. Making Citizen Soldiers: ROTC and the Ideology of American Military Service, by Michael S. Neiberg, revd., 272-74. Mann, Gurinder Singh, co-auth., Buddhists, Hindus, and Sikhs in America, revd., 137. Marchand, Suzanne, Worlds Together, Worlds Apart: A History of the Modern World from the Mongol Empire to the Present, revd., 562-63. Marks, Sally, The Ebbing of European Ascendancy: An International History of the World 1914-1945, revd., 418-19. Marty, Myron A., co-ed., Unlocking City Hall: Exploring the History of Local Government and Politics, revd., 551-52. Mary McLeod Bethune: Building a Better World Essays and Selected Documents, by Audrey Thomas McCluskey and Elaine M. Smith, eds., revd., 130-31. McCarthy, Justin, The Ottoman Peoples and the End of Empire, revd., 556-57. McCluskey, Audrey Thomas, co-ed., Mary McLeod Bethune: Building a Better World Essays and Selected Documents, revd., 130-31. McKay, Walter M., rev., Encyclopedia of Organized Crime in the United States: From Capone's Chicago to the New Urban Underworld, by Robert J. Kelly, 129-30. McKee, James, rev., Judging Lincoln, by Frank J. Williams, 427-28. McLaughlin, Milbrey W., co-auth., Professional Communities and the Work of High School Teaching, revd., 419-20. Miller, Randall M., co-ed., The Birth of the Grand Old Party: The Republicans' First Generation, revd., 550-51. Moran, Jeffrey P., The Scopes Trial: A Brief History with Documents, revd., 271-72. Moran, Jeffrey P., The Scopes Trial: A Brief History with Documents, revd., 557-58. Mott, Peter Rhoades, co-ed., The Environmental Debate: A Documentary History, revd., 131-32. My Blue Heaven: Life and Politics in the Working-Class Suburbs of Los Angeles, 1920-1965, by Becky Nicolaides, revd., 274-75. Navy Times Book of Submarines, The: A Political, Social, and Military History, by Brayton Harris; Walter J. Boyne, ed., revd., 265-66. Neiberg, Michael S., Making Citizen Soldiers: ROTC and the Ideology of American Military Service, revd., 272-74. Neimark, Peninah, co-ed., The Environmental Debate: A Documentary History, and Peter Rhoades Mott, revd., 131-32. Neville Chamberlain, by David Dutton, revd., 134-35. Nicolaides, Becky, My Blue Heaven: Life and Politics in the Working-Class Suburbs of Los Angeles, 1920-1965, revd., 274-75. Noonkester, Myron C., rev., The People with No Name: Ireland's Ulster Scots Irish, and the Creation of a British Atlantic World, 1689-1764, by Patrick Griffin, 264-65. Numrich, Paul David, co-auth., Buddhists, Hindus, and Sikhs in America, revd., 137. O'Brien, Patrick K., The Oxford Atlas of World History, revd., 559. 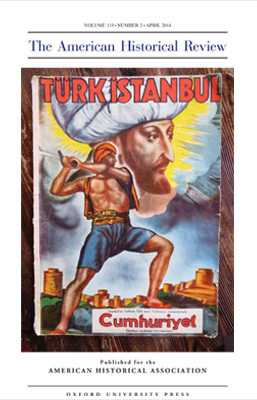 Ottoman Peoples and the End of Empire, The, by Justin McCarthy, revd., 556-57. Oxford Atlas of World History, The, by Patrick K. O'Brien, revd., 559. Parkerson, Donald H., co-auth., Transitions in American Education: A Social History of Teaching, revd., 275-76. Parkerson, Jo Ann, co-auth., Transitions in American Education: A Social History of Teaching, revd., 275-76. Parmet, Herbert S., Presidential Power from the New Deal to the New Right, revd., 138-39. Past Present & Personal: Teaching Writing in U. S. History, by William C. Kashatus, revd., 554-55. Pechatnaov, Vladimir O., co-auth., Debating the Origins of the Cold War: American and Russian Perspectives, revd., 417-18. People with No Name, The: Ireland's Ulster Scots Irish, and the Creation of a British Atlantic World, 1689-1764, by Patrick Griffin, revd., 264-65. Prakash, Gyan, co-auth., Worlds Together, Worlds Apart: A History of the Modern World from the Mongol Empire to the Present, revd., 562-63. Presidential Power from the New Deal to the New Right, by Herbert S. Parmet, revd., 138-39. Professional Communities and the Work of High School Teaching, by Milbrey W. McLaughlin and Joan E. Talbert, revd., 419-20. Pueblo Incident, The: A Spy Ship and the Failure of American Foreign Policy, by Mitchell B. Lerner, revd., 269-70. Race and Membership in American History: The Eugenics Movement, a Resource Book, by Facing History and Ourselves, revd., 415. Reagan in His Own Hand: The Writings of Ronald Reagan that Reveal His Revolutionary Vision for America, by Kiron K. Skinner, Annelise Anderson, and Martin Anderson, eds., introduction and commentary; foreword by George P. Schultz, revd., 278-79. Reed, Christopher Robert, "All the World is Here!" The Black Presence at White City, revd., 421-22. Republican Ascendancy, The: American Politics, 1968-2001, by Michael Schaller and George Rising, revd., 422-23. Rethinking the Korean War: A New Diplomatic and Strategic History, by William Stueck, revd., 560-62. Ridner, Judith, rev., Beyond the Field Trip: Teaching and Learning in Public Places, by Uma Krishnaswami, 268-69. Rising, George, co-auth., The Republican Ascendancy: American Politics, 1968-2001, revd., 422-23. Robertson, Jr., James I., co-auth., Bringing the Civil War to the Classroom: A Guide for Teachers, revd., 560. Rook, Roert E., rev., The Environmental Debate: A Documentary History, by Peninah Neimark and Peter Rhoades Mott, eds., 131-32. Ruddy, T. Michael, rev., The Age of McCarthyism: A Brief History With Documents, 2nd ed., by Ellen Schrecker, 276-77. Rust, Tom, rev., American Indians in American History 1870-2001, by Sterling Evans, 414. Ryan, Stephen, The United Nations and International Politics, revd., 139-40. Rydell, Robert W., rev., "All the World is Here!" The Black Presence at White City, by Christopher Robert Reed, 421-22. Samuel Adams, Son of Liberty, Father of Revolution, by Benjamin H. Irvin, revd., 552-53. Saylor, Thomas, rev., 19th Century Germany: Politics, Culture and Society 1780-1918, by John Breuilly, ed., 261-62. Schaller, Michael, co-auth., The Republican Ascendancy: American Politics, 1968-2001, revd., 422-23. Schrecker, Ellen, The Age of McCarthyism: A Brief History With Documents, 2nd ed., revd., 276-77. Schue, Paul, rev., The Ebbing of European Ascendancy: An International History of the World 1914-1945, by Sally Marks, 418-19. Schultz, George P., foreword, Reagan in His Own Hand: The Writings of Ronald Reagan that Reveal His Revolutionary Vision for America, revd., 278-79. Schwartz, Donald, rev., Race and Membership in American History: The Eugenics Movement, a Resource Book, by Facing History and Ourselves, 415. Scopes Trial, The: A Brief History with Documents, by Jeffrey P. Moran, revd., 271-72. Scopes Trial, The: A Brief History with Documents, by Jeffrey P. Moran, revd., 557-58. Shaara, Jeff, forward, State of the Union: New York and the Civil War, revd., 135-37. Skinner, Kiron K., co-ed., Reagan in His Own Hand: The Writings of Ronald Reagan that Reveal His Revolutionary Vision for America, revd., 278-79. Smith, Elaine M., co-ed., Mary McLeod Bethune: Building a Better World Essays and Selected Documents, revd., 130-31. Snyder, Sidney R., rev., The Pueblo Incident: A Spy Ship and the Failure of American Foreign Policy, by Mitchell B. Lerner, 269-70. Southgate, Beverley, History: What and Why? Ancient, Modern, and Postmodern Perspective, revd., 279-80. State of the Union: New York and the Civil War, by Harold Holzer, ed., and Jeff Shaara, forward, revd., 135-37. Stewart, Richard S., rev., The Ottoman Peoples and the End of Empire, by Justin McCarthy, 556-57. Stueck, William, Rethinking the Korean War: A New Diplomatic and Strategic History, revd., 560-62. Symcox, Lynda, Whose History? The Struggle for National Standards in American Classrooms, revd., 423-24. Talbert, Joan E., co-auth., Professional Communities and the Work of High School Teaching, revd., 419-20. Theoharis, Athan, Chasing Spies: How the FBI Failed in Counterintelligence But Promoted the Politics of McCarthyism in the Cold War Years, revd., 280-81. "They Made Us Many Promises:" The American Indian Experience 1524 to the Present, 2nd ed., by Philip Weeks, ed., revd., 426-27. Thomas, Christopher A., The Lincoln Memorial and American Life, revd., 424-26. Tignor, Robert, co-auth., Worlds Together, Worlds Apart: A History of the Modern World from the Mongol Empire to the Present, revd., 562-63. Tobin, Kathleen A., The American Religious Debate Over Birth Control, 1907-1937, revd., 563-64. Tong, Benson, co-ed., The Human Tradition in the American West, revd., 281-82. Transitions in American Education: A Social History of Teaching, by Donald H. Parkerson and Jo Ann Parkerson, revd., 275-76. Tsin, Michael, co-auth., Worlds Together, Worlds Apart: A History of the Modern World from the Mongol Empire to the Present, revd., 562-63. Tucker, Spencer C., A Short History of the Civil War at Sea, revd., 283-84. United Nations and International Politics, The, by Stephen Ryan, revd., 139-40. Unlocking City Hall: Exploring the History of Local Government and Politics, by Michael W. Homel; David E. Kyvig and Myron A. Marty, eds., revd., 551-52. Ussach, H. B., rev., Unlocking City Hall: Exploring the History of Local Government and Politics, by Michael W. Homel; David E. Kyvig and Myron A. Marty, eds., 551-52. Vieira, Michael A., rev., The Republican Ascendancy: American Politics, 1968-2001, by Michael Schaller and George Rising, 422-23. War and Competition between States, by Phillippe Contamine, ed., revd., 410-11. War of 1812, The, by David S. Heidler and Jeanne T. Heidler, revd., 416. Weeks, Philip, ed., "They Made Us Many Promises:" The American Indian Experience 1524 to the Present, 2nd ed., revd., 426-27. Welter, Mark, rev., State of the Union: New York and the Civil War, by Harold Holzer, ed., and Jeff Shaara, forward, 135-37. When Hens Crow: The Woman's Rights Movement in Antebellum America, by Sylvia D. Hoffert, revd., 266-67. Whose History? The Struggle for National Standards in American Classrooms, by Lynda Symcox, revd., 423-24. Williams, Carolyn, rev., Building the Kingdom: A History of Mormons in America, Claudia Lauper Bushman and Richard Lyman Bushman, 133-34. Williams, Frank J., Judging Lincoln, revd., 427-28. Williams, Raymond, co-auth., Buddhists, Hindus, and Sikhs in America, revd., 137. Wolf, Christopher, rev., Worlds Together, Worlds Apart: A History of the Modern World from the Mongol Empire to the Present, by Robert Tignor, Jeremy Adelman, Stephen Aron, Stephen Kotkin, Suzanne Marchand, Gyan Prakash, and Michael Tsin, 562-63. Worlds Together, Worlds Apart: A History of the Modern World from the Mongol Empire to the Present, by Robert Tignor, Jeremy Adelman, Stephen Aron, Stephen Kotkin, Suzanne Marchand, Gyan Prakash, and Michael Tsin, revd., 562-63.